Napa Valley Bioscience is an American, research-driven, novel nutraceutical company headquartered in Santa Monica, California, USA. We make innovative products. We also research, develop, and manufacture products for others. A number of novel nutraceuticals are currently in development at Napa Valley Bioscience. Just like the revolutionary Sunsafe Rx, these innovative products are being pursued to serve currently unmet market needs and are precisely formulated for the maintenance of a healthy life. After thoroughly researching, developing, and testing to prove safe and efficacious, these proprietary therapeutic formulations will be made available to discriminating customers. Please look for these exciting and innovative products in the near future. Sunsafe Rx is a nutritional supplement made with ingredients that support your skin and eyes. One capsule per day provides natural, healthy, anti-aging protection. Sunsafe Rx was scientifically created to combat the aging effects of environmental stresses on human skin and eyes. Stemming from years of extensive research into compounds existing in nature that are able to defend plants and animals against free-radical damage, a product that combines the best of what nature has to offer was designed, developed, and tested. The result is an incredible capsule, made with ingredients from foods and plants that have been shown to naturally promote your defenses against the effects of exposure to the elements. Research shows the ingredients in Sunsafe Rx are able to diminish the appearance of skin aging and wrinkles while at the same time providing many other health benefits for your skin, eyes, and whole body. The secret of Sunsafe Rx is a precise blend of powerful antioxidants called Antioxidine. Decades of research and hundreds of clinical studies and published scientific papers show that the ingredients in our proprietary Antioxidine formula have a protective effect for your skin and eyes. It’s a groundbreaking formulation that’s natural and incredibly effective. Environmental stresses are continuously trying to age your skin. But Sunsafe Rx is always working: it supports your whole body, isn’t messy, and won’t rub off. In fact, Sunsafe Rx may be the single most important anti–aging product you ever use. And it's made exclusively by Napa Valley Bioscience. Not all nutraceuticals are the same; quality ingredients and manufacturing matter. Napa Valley Bioscience creates premium products produced using only the highest-quality ingredients available, all sourced from reputable suppliers. Our products are natural, healthy, and effective. All our ingredients come from natural sources, and all raw materials are tested prior to manufacturing to confirm purity and potency. Likewise, all final products are tested after production to ensure safety and efficacy. Our products are manufactured according to current Good Manufacturing Practices (cGMP) in a certified, FDA-registered manufacturing facility in California, United States of America, employing the highest possible quality standards available. Using superior ingredients and stringent production processes costs more, but when health is concerned we think it is well worth it. We love to collaborate with others. And at Napa Valley Bioscience we currently have both a library of well-research pioneering product ideas and surplus developmental capacity. If you represent a biotechnology or nutritional supplement company interested in collaborating on nutraceutical creation, development, and/or manufacturing, or are simply looking for a new product to launch, please reach out to us. 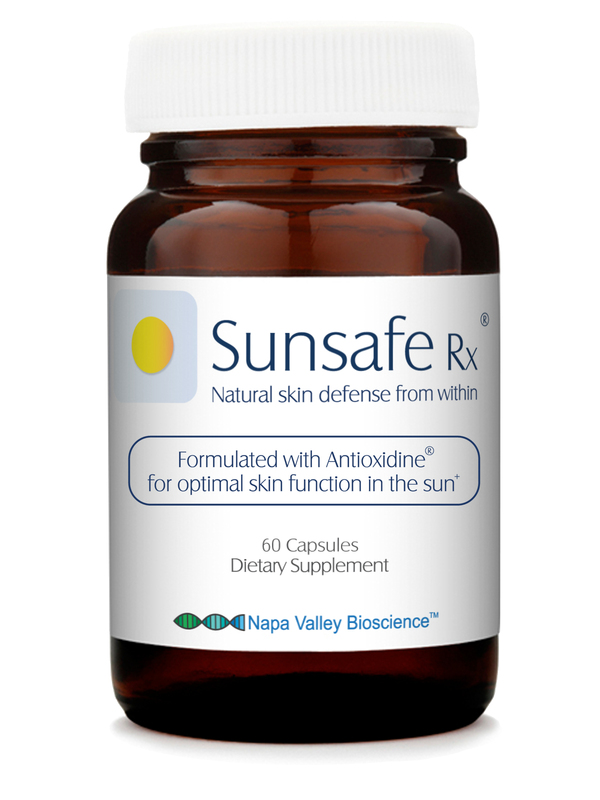 Sunsafe Rx® and Antioxidine® are registered trademarks of Napa Valley Bioscience. The statements on this website have not been evaluated by the FDA. These products are not intended to diagnose, treat, cure, or prevent any disease. Thank you for visiting NVBio.com, a site owned and operated by Napa Valley Bioscience. These Terms And Conditions apply to NVBio.com and all associated websites run by either Napa Valley Bioscience or its subsidiaries or affiliates (collectively called the "Site"). These Terms And Conditions govern your use of, and purchase from, Napa Valley Bioscience's Site. In addition, when you use any services available on the Site, you will be subject to these Terms And Conditions. When you access, browse, or otherwise use Napa Valley Bioscience's Site, you agree to accept all the terms and conditions specified in these Terms And Conditions. Subject to these Terms And Conditions, you are granted a limited, revocable, non-transferable, and non-exclusive license to access Napa Valley Bioscience's Site for the purpose of reading information or shopping for items offered on the Site. This license does not extend to any commercial use or use on behalf of any third-party, and Napa Valley Bioscience reserves the right to end this license or refuse offering service, at Napa Valley Bioscience's discretion, to anyone deemed in violation of these Terms And Conditions or applicable laws, or to any customer or visitor deemed harmful to Napa Valley Bioscience's business. Any use of this Site not expressly authorized in these Terms And Conditions is strictly prohibited and will terminate the license agreement granted to you. You shall not use this Site for any nefarious activity, nor upload, distribute, or otherwise publish through this Site any material, content, malicious or harmful code or properties, or other information that violates or infringes upon the intellectual property rights of any individual. You also shall not use this Site for any activity that is defamatory, threatening, indecent, libelous, or may violate any criminal or civil U.S. or international laws. Napa Valley Bioscience may assign an account identification and password to enable you to access certain portions of the Site. Each time you access your account, you agree to abide by these Terms And Conditions. You are also solely responsible for all access to and use of this account information, whether or not such access is actually authorized by you, including by not limited to any communications, transmissions, and obligations-including financial obligations-incurred through such access or use. You are also responsible for the security and confidentiality of this account information. Data, including prices and availability, may be incorrectly or inaccurately displayed on Napa Valley Bioscience's Site due to system, typographical, or other errors. In the case of products listed with incorrect or inaccurate prices or information, Napa Valley Bioscience reserves the right to refuse or cancel any order placed for these products, regardless of whether or not the purchase has already been completed and the payment processed. If a payment has already been processed for an order that is subsequently cancelled by Napa Valley Bioscience, Napa Valley Bioscience will refund the customer the full purchase price. Napa Valley Bioscience's product prices, information, and availability are subject to change without notice. All content included on Napa Valley Bioscience's Site, including but not limited to text, graphics, images, photographs, logos, icons, data, and software, and any trademarks, copyrights, or other intellectual property, is the property of Napa Valley Bioscience or its suppliers and is protected by United States and international copyright, patent, and/or trademark laws and other unfair competition laws. The risk for loss and title of items purchased by you, from Napa Valley Bioscience, pass to you upon delivery of such items to you by a carrier. Except as otherwise provided as the standard terms of sale of any given product and expressly described in Napa Valley Bioscience's product guarantee, Napa Valley Bioscience disclaims all warranties, express or implied, and makes no representations or warranties of any kind as to the operation of this Site or the products or services offered on this Site. Napa Valley Bioscience and its members, employees, and owners, will not be liable for any damages that may arise from the use of this Site or any information, products, or services included on, or offered through, this Site, including, but not limited to, direct, indirect, incidental, punitive, exemplary, or consequential damages. Where some locations may not allow limitations on liability, these limitations of liability apply to the maximum extent permitted by law. Napa Valley Bioscience's Site may contain links to third-party sites. Napa Valley Bioscience does not in any way monitor the content on these third-party sites and, furthermore, cannot and does not make any guarantees regarding the content on these third-party sites. Napa Valley Bioscience takes no responsibility concerning the content on third-party sites, and the use of these sites and links is at the user's own risk. Napa Valley Bioscience respects the intellectual property of other individuals and businesses. If at any time you believe that Napa Valley Bioscience is using intellectual property that in some way constitutes infringement, please contact us. Visitors to Napa Valley Bioscience's Site may post or publish comments or submit other material, ideas, questions, content, or communications. By makings these comments or submissions, you are granting Napa Valley Bioscience a non-exclusive, royalty-free, irrevocable, and perpetual right to use, reproduce, modify, display, or otherwise adapt or disseminate this content, unrestricted, for any purpose, without acknowledgement or compensation to you. By making these comments or submissions, you are also submitting that you own this content, have the right to submit it, that it is accurate and not misleading, and that the use of this content does not violate any rules or laws or cause injury to any person. Napa Valley Bioscience also reserves the right to monitor, edit, remove, or otherwise use or not use the content posted by you or any other third-party. By visiting Napa Valley Bioscience's Site, you agree that the laws of the state of California will govern these Terms And Conditions and any dispute that may arise between you and Napa Valley Bioscience or any of its affiliates or subsidiaries. Any dispute relating in any way to your visit to Napa Valley Bioscience's Site or to the products or services sold by Napa Valley Bioscience or any of its affiliates or subsidiaries, shall be submitted for arbitration in the state of California; by visiting Napa Valley Bioscience's Site, you consent to exclusive jurisdiction and venue in the state of California. Napa Valley Bioscience reserves the right to, without prior notice, limit, restrict, or otherwise terminate the use of this Site by anyone infringing on these Terms And Conditions. Napa Valley Bioscience also reserves the right to close your account or revoke your login password, if applicable, at any time, without prior notice, at which time your rights under these Terms And Conditions will be revoked. If any of the provisions in these Terms And Conditions is deemed unlawful, void, invalid, or otherwise unenforceable, then that provision will be deemed severable from these Terms And Conditions and shall not in any way affect the validity or enforceability of the remaining provisions. Napa Valley Bioscience reserves the right to modify or change these Terms And Conditions, or any other practices pertaining to the usage of this Site, at any time without notice. If any modifications are made to the use of this Site, these changes will be reflected in revised Terms And Conditions, and these updated Terms And Conditions will take effect when posted. These Terms And Conditions are the most current version, and the date of the latest revision is denoted at the top of these Terms And Conditions. We encourage you to read and gain familiarity with these Terms And Conditions. The use of Napa Valley Bioscience's Site constitutes your acceptance of these Terms And Conditions. If you have any questions or comments about these Terms And Conditions, please email us at info@NVBio.com. The statements made throughout this website are intended for educational purposes only, and while we believe them to be accurate, they should not be substituted for the advice of a qualified healthcare professional. This product is formulated and intended for use by adults. This product has not been tested in children or pregnant or lactating women. Pregnant or lactating women or individuals with special medical needs should consult with their healthcare professional before use. Due to the diversity of human skin, sensitivity to the sun, metabolism, and other characteristics that make us each unique, individual results may vary. Ultraviolet radiation from the sun, even while using this product, can still be harmful. Care should be taken to protect your skin from excessive sun exposure. Repeated exposure of unprotected skin to ultraviolet radiation may increase the risk of skin aging, skin cancer, and other harmful effects to the skin even if you do not burn. This product is not intended to replace topical sunscreen lotion, and can, in fact, be used synergistically with a topical sunscreen lotion. For further disclosure on the information provided on this Site and the rules governing its use, please read our Terms And Conditions. While browsing the Napa Valley Bioscience Site it is not necessary to reveal personal information about yourself. We may, however, collect certain non-personal information from visitors to the Site that cannot and will not be used to identify specific individuals. Information about visitors to the Site that may be collected may include such information as IP address, internet service provider (ISP), browser type, referring and exit pages, software platforms, date and time of visit, click analysis, page views, demographic information, and other information that may be used to analyze patterns or trends, prevent fraud or abuse, optimize our product offerings or promotional efforts, understand your preferences or interests, customize your shopping experience, or otherwise improve Napa Valley Bioscience's Site and customer service. In some circumstances, Napa Valley Bioscience may also collect information via cookies or other collection devices and monitoring services to enhance your browsing and shopping experience. These cookies or collection devices may be used to measure the usability of the Site, track visitors, track and measure the effectiveness of our marketing programs, learn more about how our customers and visitors use the Site, or deliver better service to our customers and visitors. The information collected may include total unique visitors, pages viewed, time spent on pages or on the Site in general, or other non-personal information used to improve the functionality of Napa Valley Bioscience's Site, products, and service. If you decide to purchase a product or register an account on the Site, if applicable, we request personal information from you, and we may store the information you provide us, whether written or oral, or via the Site, e-mail, phone, fax, or other means. This personal information may be used to identify you and may include, but is not limited to, your credit card information (including name on the card, card issuer, expiration date, and CVV), your name, home address, billing address, shipping or other physical address, phone number, email address, gender, occupation, birth date, marital status, anniversary, other contact information, or additional information about your interests. The information you provide to us may be aggregated over time. Additionally, we may combine this information with other publicly available information collected either by us directly or via our partners or other third-parties. In some situations, we may have to share your information with trusted third-party service providers or other partners. This may be required to perform certain services on your behalf, including credit checks and verifications, credit card and other payment processing, shipping, data storage, website hosting, emailing, marketing, mailing, and other services related to managing visitor and customer accounts and running an e-commerce website. Please note that these service providers only receive the information deemed necessary for them to perform their specific service or function and are not authorized to use this information for any other purposes. We are also authorized and may use your personal information for the purpose of preventing or thwarting crime, reducing the risk of fraud, and investigating or taking action against any illegal activities or suspected fraud. We reserve the right to use your information to ensure the safety of Napa Valley Bioscience personnel or other workers otherwise associated with the company. We also may use your information, if deemed necessary, to comply with applicable governmental laws, rules, regulations, or legal processes. Additionally, we may use your information to enforce any agreement we have with you, our customers, or visitors to the Site. Finally, we may use your personal information to create anonymous records of your data for internal analysis. In the event of the sale of Napa Valley Bioscience or company assets, a merger, an acquisition, insolvency, bankruptcy, or receivership, personal information may be transferred as one of the assets of Napa Valley Bioscience. Napa Valley Bioscience gives you several choices in regards to the management of your information. If your personally identifiable information that Napa Valley Bioscience has collected changes, or you would like access to this data, Napa Valley Bioscience will gladly disclose this information to you or change, correct, or delete it, as allowed by law. To access or edit this information please contact us by either phone or email. If you prefer that we not share any of your personal information with third-parties-even if this results in less efficient service to you or our inability to provide a service or complete a sale to you-please contact us and we will satisfy your request. If you would like to opt out of our mailing list, if applicable, you may do so by contacting us directly. Please note that opting out of our mailing list or requesting that we not share any of your personal information with third-parties will not affect our communications with you, either by phone, email, or other method, regarding your orders placed with us, nor does it affect the use of non-personally identifiable information. At Napa Valley Bioscience and on the Site, the security of any and all customer information-especially sensitive personal information-is extremely important to us and we are committed to taking precautions to protect it from unauthorized access or use both online and offline. For online transactions, Napa Valley Bioscience uses a 256-bit Secure Socket Layer-the strongest encryption available on the web-to guarantee your transaction is safe and secure. Similarly, any data that may be stored offline is kept on secure servers with restricted access. No physical records or copies of personal customer information are stored, and any faxes or printouts with personal customer information are shredded and securely disposed of after their immediate use as may be necessary.